Egypt Travel Guide will pick you up from your hotel, then you will travel to El Alamein. Proceed to World War II remains and cemeteries. Your first stop will be at the Military Museum including displays of weapons, military garb and tanks. Descriptions of the actions of Montgomery, Rommel and the others participated in the battle are also on display. Continue to visit the WW II Cemeteries, located on the west of the town, on a small peninsula overlooking the sea. The citadel like cemeteries is the final resting place for Common wealth, Greek, Italian and German soldiers. 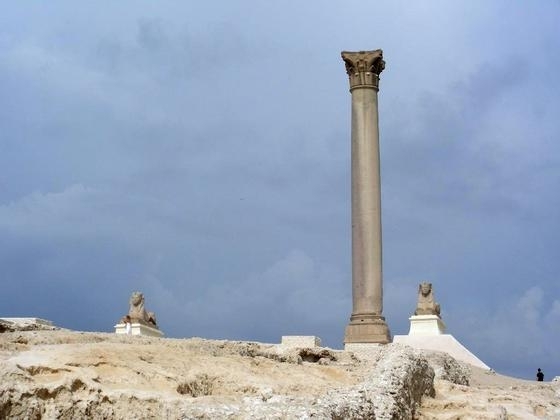 Drive to Alexandria where you will see the Pompay's pillar. Then proceed to Qaitbay Citadel from outside which was built on the site of the ancient pharohs ( lighthouse ) of Alexandria. Visit the Catacombs which are the largest Roman Cemetery consisting of three levels cut in the rock. After finishing the day tour, you will return to hotel.